Figure 4.2. The Account Tree Display. This is an image of the Accounts tab. The Menubar for the Accounts Tree window contains the following options. The following table describes the options in the File Menu. Clicking on the File option of the Menubar will “pull down” a menu of options described in Table 4.1, “Account Tree - File Menu - Access to file, account operations and printing.”. Table 4.1. Account Tree - File Menu - Access to file, account operations and printing. Opens an already existing GnuCash data file. Opens the Import sub-menu to import files from other financial programs. Starts the QIF file Import process. Starts the OFX/QFX file Import process. Starts the CSV Account file import process. The file to import must be in the same format as the one exported by GnuCash. Starts the CSV Transactions file import process. The file to import must be a delimited file. Starts the replaying of a GnuCash log file. Used for data recovery from "crashes". Import an end-of-day account statement in SWIFT MT940 format into GnuCash. Import an interim account statement in SWIFT MT942 format into GnuCash. Import a traditional german DTAUS file into GnuCash. Import a DTAUS file into GnuCash and transmit its orders by Online Banking. Open the Import Transactions from text file window. Open the Import Customers and Vendors from text file window. Saves the currently open file. Do NOT store your data file in ~/.gnucash/books. Reload the last saved version of the currently opened file. Useful if you need to discard changes made to the data and not yet saved. This entry is only activated if a printable item like a report or an invoice is selected.. Lets you choose the paper size, layout and margins for printing. Exports your account hierarchy to a delimited CSV file. Does not export data. Exports transactions to a delimited CSV file. Export the active Register to a CSV file. Exports your account hierarchy to a new GnuCashfile. Does not export data. Sets options for this GnuCash data file. Numbered list of most recently opened GnuCash data files. In the initial Account tree this item is not available - it will be grayed out. Table 4.2. Account Tree - Edit Menu - Access to file and account editing operations and preferences. Performs a standard Cut operation. Performs a standard Copy operation. Performs a standard Paste operation. Starts the Renumber Account assistant. See Section 5.6, “Renumbering Subaccounts”. This item is selectable only if you have highlighted an account with at least one subaccount in the accounts tree. Opens the register window for the currently selected account. Opens a register window that displays all the transactions for the selected account and for all its subaccounts. Set criteria for a search for a specific transaction. See Section 8.1, “Find” for specifics on searches. Preferences (GnuCash → Preferences on MacOS). Customize GnuCash for location, style, and numerous other preferences. See Section 10.2, “Setting Preferences”. Modify/customize Style Sheets. See Section 10.4, “Changing Style Sheets”. Table 4.3. Account Tree - View Menu - Changes display window view. Check-box to enable/disable display of Toolbar. Check-box to enable/disable display of Summarybar . Check-box to enable/disable display of Statusbar. Set filter for accounts displayed in the Account Tree display. Open a new tab that displays the account tree. Table 4.4. Account Tree - Actions Menu - Setup scheduled transactions, repair accounts, perform stock splits, transfer and reconcile transactions. This is shown only if WITH_AQBANKING was set while building GnuCash. Not all options are for all institutions available. Get the balance for the selected account. Get the transactions online through Online Banking. Issue a new international European (SEPA) transaction online through Online Banking. Issue a new bank-internal transaction online through Online Banking. Issue a new international European (SEPA) direct debit note online through Online Banking. Opens the window to create a new budget. Creates a new account and opens the account properties window. Starts the New Account Hierarchy Setup assistant. Starts the Transfer assistant for transfer between accounts. Opens the auto-clear screen where you can fill up the automatic clear information. Opens the Lots in Account form. Check for and repair unbalanced transactions and orphan splits in this account. Check for and repair unbalanced transactions and orphan splits in this account and its subaccounts. Check for and repair unbalanced transactions and orphan splits in all accounts. GnuCash gives warnings when certain operations are attempted, such as removing a transaction or removing the splits of a transaction. The warning message gives you the option to not give you these warnings when attempting the operation. Check-boxes labeled Remember and don’t ask me again and Remember and don’t ask me again this session allow disabling the warnings. This option resets the warnings to the default, i.e. display all warnings. Warnings may be selectively enabled. Open the form to rename the current page/tab. Table 4.5. Account Tree - Business Menu - Access small business features of GnuCash. Open a customers overview page. Start the form to create a new customer. Start the assistant to search for a customer. Start the form to create a new invoice. Start the assistant to search for an invoice. Start the form to create a new job. Start the assistant to search for a job. Starts the Process Payment assistant. Requires an account of type "A/Payable" before running assistant. Open a vendors overview page. Start the form to create a new vendor. Start the assistant to search for a vendor. Start the form to create a new bill. Start the assistant to search for a bill. Open an employees overview page. Start the form to create a new employee. Start the assistant to search for an employee. Start the form to create a new expense voucher. Start the assistant to search for an expense voucher. View and edit the list of tax tables. View and edit the list of Billing Terms. View and edit the list of Bills Due Reminder. This is a brief listing of each of the available reports and graphs. See Section 9.3, “Reports Listed By Class” for specific report details. Each report or graph may be customized by selecting a different Stylesheet or by pressing the Options button in the Toolbar. Table 4.6. Account Tree - Reports Menu - Access GnuCash Reports and Charts. Report showing the balance of selected accounts. Report showing a summary of future transactions. Open the screen to manage saved user configured reports. Open a screen where you can enter the required information to close the current accounting period. See Section 8.9, “Close Book”. Opens a new GnuCash empty window. Moves the current tab into a new window. A numbered list of open windows. Table 4.9. Account Tree - Help Menu - Access to this help and the Tutorial and Concepts Guide. Shows short notes about features you might otherwise miss. 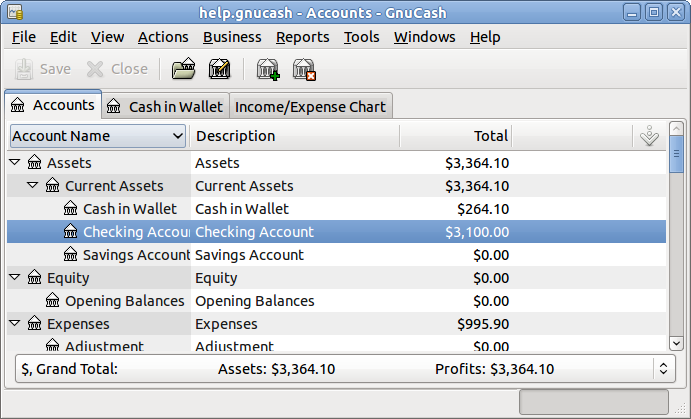 The GnuCash main Window has a number of buttons in the Toolbar to quickly access some common functions used with the specific active tab. The Toolbar can be hidden or shown by selecting View → Toolbar. The specific options displayed in the Toolbar vary with the functions available to the "active tab". A brief description of the function of a Toolbar button is displayed when the mouse pointer is placed over the icon for a couple of seconds. Perform a save on the data file, commit all transactions to the data file. This icon is not available for the first accounts tab. It is available for additional account tree displays. Open a transaction register of the selected account. The Tab bar displays “file/notebook folder” style tabs for open transaction registers, reports and the account tree. The account tree displays the list of your accounts in hierarchical format. This enables you to organize your accounts by type. The triangle shape (or plus sign) beside the account name is used to open and close the account tree. When you click on the triangle (plus sign), it changes from a rightward-pointing into a downward-pointing sign (minus sign) to indicate that the tree is opened. You will then see offset below the account name either a list of the sub account(s) or another triangle (plus sign) to the left of an account. This indicates another lower level of the account tree. In the main pane are also shown, by default, four columns: Account Name, Type, Description and Total. For each account, this informations, if available, is displayed in the same row of the account. The columns shown for each account in the Account Tree can be customized to suit your needs. Click on the arrow icon on the far right of the Account Tree window to display a drop down list of column options. Click on a column description to add it to the Account Tree window. Click again on the column description to hide it. The default display for the account tree window is in Notebook mode. This is indicated by the tab in the tab row of the main window. Other tabs will appear beside this one when you open reports, account registers or additional account trees. The Summarybar displays balances appropriate for the opened account type at a glance. Usually accounts display today’s account balance, any balance for future dates, a balance for cleared items and a reconciled balance. Stock accounts, however, display shares totals and their value. The Summarybar can be hidden or shown by selecting View → Summarybar. The Statusbar displays informations about the currently highlighted menu item. It also shows a progress bar when opening or saving a GnuCash data file or generating reports. The Statusbar can be hidden or shown by selecting the Statusbar item on the View menu.